← 3 Year Web Hosting For Only RM100! Looks like quite a good plan. Wonder if can pay instalment using credit card? Some banks allow 12 months interest free instalment plan. It is possible I guess. It would be easy on the wallet and allows you to enjoy this promotion. In the event the puschaser cancels the contract prior to the 24th month, he will need to pay rm3816 minus whatever amount already paid. For more info, you can contact the nearest Celcom centre or Blue Cube. Its a good and valued package.. for those who are cannot afford to buy laptop.. but please take note that, the notebook provided is not the best one..
Of course you can use the notebook for internet surfing and any other basic work (such as microsoft office, etc). But if you think you need high performance notebook, better not to subsribe this plan. In addition, you’ll be tied under the contract 24 month (2 years). Thanks for sharing your experience. If that is the case, their deal is the norm. Many other “package” promotion work that way. That is, if you terminate the contract before it expires, you’ll need pay the full amount anyway. You sound a little negative towards the notebook. It definitely is not a high end notebook. However, it is more than adequate for normal to intermediate use. I’m so happy if available for a monthly unlimited access,active used only for 10 days in month,for example RM 25 per month.I thing many people will be more interest about it.Thank you. Celcom should come up with a choice of various packages to make broadband more friendly user. mobile car battery support at remote locations. Existing Celcom broadband modem is just stand alone usage. HI wanna to know. Is it means the RM159 per month already including the broadband fee? or I need to pay another RM68 for the internet fee? The RM159 only installment cost for laptop and modem? I am still not sure about this package. is this what you mean we pay internet access for only RM68 per month with unlimited time to use internet access plus we pay again for the laptop and modem for RM159 per month for 24month. And after we pay both the request package, you give us the laptop and modem and we bring it home, correct? I am living Belaga area 50miles away from town can I use celcom broadband without any problem? I want to start subscribe next month after receiving your answer. Hope you reply immediately upon receiving my message ok.
@Busy Bee: The RM159 promotion includes the modem, notebook and Celcom Broadband service (the RM68 package). @rozaihan: Anda perlu daftar pakej ini dari Celcom atau Blue Cube. @Andrew Balit Jemarang: You only need to pay RM159 per month for 24 months (minimum contract) and you will get 3 things — notebook, USB modem and Celcom Braodband service (worth RM68). That means the total you need to pay is RM3816 (RM159 X 24). Hi..this package still available or not?.. Since this package is for 24 months contract, how about the payment method for every month?.. I think the specs that your given for the laptop for the screen size was not correct, because in celcom website, it was 14.1 inch instead of 15.4 inch. Hii.. sy cuma ingin tahu.. promotion ini sampai bila? hi…i’m celcom broad d98 user..can i join this promotion…?? sy pon nak tanya gak, saya dah buat broadband, n saya nak jugak yang ni, macam mana nak buat? @Tok Guru: Their promotion is while stocks last. The specs I gave is correct as the model was HP Compaq Presario C700. That stock must have finished as they are giving out another model right now — thus the difference in screen size. @adda: While stocks last. Please check the Celcom website for promotion updates. 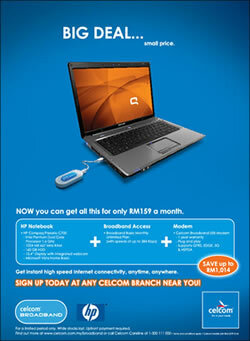 @raziman & budin: I believe this Celcom Broadband promotion is only for new customers. Existing customers do not get the notebook. Unless you cancel your existing account and sign up for the new one but I assume early cancellation fees (if any) do apply. Please contact Celcom customer service to confirm. sy nak tahu masih ada lagi tak promotion ni RM159 a mth…… klu ada bleh pm sy tak…. After 24 months, do we have to pay rm159 if we want to continue subscribe the broadband? 1.I am very dissapointed with the celcom sale service.I was told that this promotion available at the blue cube and the celcom centre.I went to 2 blue cube centres and was told the promotion only available at the celcom main service centre.I am tired to tell what happened next when i once again went to the main centre and dealing with the staff that is not fully trained and well informed about the latest promotion.Hopefully this matter will be solved and made clear by the celcom sales team. 2.Question: During the 24 months contract,will i be able to upgrade my broadband( the rm 68 one) to a higher package? 3.Question: Can you tell the actual price of the note book offered and what is the latest brand ,is it the Hp compact presario c700 or Hp CQ40?I am asking this because the celcom staff that i went to that day given a lot of wrong information to me. Question: What are the software provided in the notebook?